Abstract: The development of the space geodesy techniques has made it possible to obtain the ellipsoidal height, thus bringing new opportunities for the research of the second geodetic boundary value problem. The Hotine-Helmert boundary value problem, i.e. the second boundary value problem based on the Helmert's second condensation method, is studied in this paper. The definitions and algorithms for the direct and indirect topographic effects are presented at first. Then a calculation model for the Hotine-Helmert boundary value problem is presented in this contribution. The secondary indirect topographic effect on the gravity caused by the terrain condensation is unnecessary in the Hotine-Helmert boundary-value model, making it easier than the Stokes-Helmert boundary-value model. Furthermore, a kind of spheroidal Hotine kernel function whose low degrees are modified is introduced, which can effectively improve the accuracy of the quasi-geoid compared with the traditional spheroidal kernel. 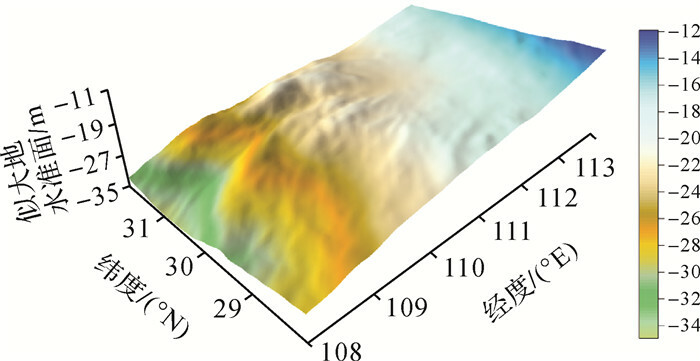 In order to verify the validity and practicability of the Hotine-Helmert boundary-value calculation model, the gravimetric quasi-geoid in central China with the area of 6°×4° and the resolution of 1.5'×1.5' is solved according to the Hotine-Helmert boundary-value model, using the first 360 degrees of EIGEN-6C4 model as the reference model. The accuracy of the determined gravimetric quasi-geoid in the test area is ±4.8 cm. 管泽霖, 管铮, 黄谟涛, 等. 局部重力场逼近理论和方法[M]. 北京: 测绘出版社, 1997. GUAN Zelin, GUAN Zheng, HUANG Motao, et al. Theory and method of regional gravity field approximation[M]. Beijing: Surveying and Mapping Press, 1997. 许厚泽. 关于高程系统的思考[J]. 地理空间信息, 2016, 14(1): 1–3. 吴晓平. 似大地水准面的定义及在空中测量中涉及的问题[J]. 测绘科学, 2006, 31(6): 24–25. 李建成. 我国现代高程测定关键技术若干问题的研究及进展[J]. 武汉大学学报(信息科学版), 2007, 32(11): 980–987. LI Jiancheng. Study and progress in theories and crucial techniques of modern height measurement in China[J]. Geomatics and Information Science of Wuhan University, 2007, 32(11): 980–987. MARTINEC Z. Boundary-value problems for gravimetric determination of a precise geoid[M]. Berlin: Springer, 1998. 李建成. 最新中国陆地数字高程基准模型:重力似大地水准面CNGG2011[J]. 测绘学报, 2012, 41(5): 651–660, 669. LI Jiancheng. The recent Chinese terrestrial digital height datum model:gravimetric quasi-geoid CNGG2011[J]. Acta Geodaetica et Cartographica Sinica, 2012, 41(5): 651–660, 669. 吴晓平, 李姗姗, 张传定. 扰动重力边值问题与实际数据处理的研究[J]. 武汉大学学报(信息科学版), 2003, 28(S1): 73–78. WU Xiaoping, LI Shanshan, ZHANG Chuanding. Problem of the boundary value of disturbing gravity and practical data processing[J]. Geomatics and Information Science of Wuhan University, 2003, 28(S1): 73–78. 李斐, 陈武, 岳建利. GPS在物理大地测量中的应用及GPS边值问题[J]. 测绘学报, 2003, 32(3): 198–203. 李斐, 陈武, 岳建利. GPS/重力边值问题的求解及应用[J]. 地球物理学报, 2003, 46(5): 595–599. 李斐, 岳建利, 张利明. 应用GPS/重力数据确定(似)大地水准面[J]. 地球物理学报, 2005, 48(2): 294–298. 魏子卿. 以地心参考椭球面为边界面的第二大地边值问题引论[J]. 测绘科学与工程, 2015, 35(1): 1–6. WEI Ziqing. Introduction to the second geodetic boundary-value problem with the geocentric reference ellipsoidal surface as the boundary[J]. Geomatics Science and Engineering, 2015, 35(1): 1–6. WANG Y. Precise computation of the direct and indirect topographic effects of Helmert's second method of condensation using SRTM30 digital elevation model[J]. Journal of Geodetic Science, 2011, 1(4): 305–312. 郭春喜, 王惠民, 王斌. 全国高分辨率格网地形和均衡改正的确定[J]. 测绘学报, 2002, 31(3): 201–205. 罗志才, 陈永奇, 宁津生. 地形对确定高精度局部大地水准面的影响[J]. 武汉大学学报(信息科学版), 2003, 28(3): 340–344. LUO Zhicai, CHEN Yongqi, NING Jinsheng. Effect of terrain on the determination of high precise local gravimetric geoid[J]. Geomatics and Information Science of Wuhan University, 2003, 28(3): 340–344. FORSBERG R. A study of terrain reductions, density anomalies and geophysical inversion methods in gravity field modeling[R]. Columbus(Ohio): Ohio State University, 1984. 马健, 魏子卿, 沈忱, 等. 地形改正与地形直接影响的转化关系[J]. 测绘科学技术学报, 2017, 34(3): 245–250. MA Jian, WEI Ziqing, SHEN Chen, et al. Transformation relation between the topographic correction and the direct topographic effect[J]. Journal of Geomatics Science and Technology, 2017, 34(3): 245–250. MA Jian. Theory and methods of the Hotine-Helmert boundary value problem for the determination of the quasi-geoid[D]. Zhengzhou: Information Engineering University, 2018. 刘敏, 黄谟涛, 欧阳永忠, 等. 顾及地形效应的重力向下延拓模型分析与检验[J]. 测绘学报, 2016, 45(5): 521–530. 翟振和, 王兴涛, 李迎春. 解析延拓高阶解的推导方法与比较分析[J]. 武汉大学学报(信息科学版), 2015, 40(1): 134–138. ZHAI Zhenhe, WANG Xingtao, LI Yingchun. Solution and comparison of high order term of analytical continuation[J]. Geomatics and Information Science of Wuhan University, 2015, 40(1): 134–138. WEI Ziqing. High-order radial derivatives of harmonic function and gravity anomaly[J]. Journal of Physical Science and Application, 2014, 4(7): 454–467. 马健, 魏子卿, 任红飞, 等. 顾及远区影响的向下延拓实用算法[J]. 地球物理学进展, 2018, 33(2): 498–502. MA Jian, WEI Ziqing, REN Hongfei, et al. Practical algorithm of the downward continuation considering the far-zone effect[J]. Progress in Geophysics, 2018, 33(2): 498–502. 李建成, 晁定波. 利用Poisson积分推导Hotine函数及Hotine公式应用问题[J]. 武汉大学学报(信息科学版), 2003, 28(S1): 55–57. LI Jiancheng, CHAO Dingbo. Derivation of Hotine function using poisson integral and application of Hotine formula[J]. Geomatics and Information Science of Wuhan University, 2003, 28(S1): 55–57. 程芦颖. 不同扰动位泛函间的积分变换广义核函数[J]. 测绘学报, 2013, 42(2): 203–210. CHENG Luying. General kernel functions based on integral transformation among different disturbing potential elements[J]. Acta Geodaetica et Cartographica Sinica, 2013, 42(2): 203–210.